My kids love music and dancing. If I can combine music with teachable lessons I’m all for it! We recently got the chance to review some cute music from Happy Kids Songs and the kids had a lot of fun! 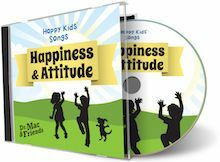 Happy Kids Songs offers eight award-winning albums that include five songs each. We had the pleasure of reviewing three of those albums: Friends & Sharing (Set 1), Happiness & Attitude (Set 5), and Manners & Character (Set 6). These songs are designed for children ages 3-8, but can be enjoyed by children ages 0-9. 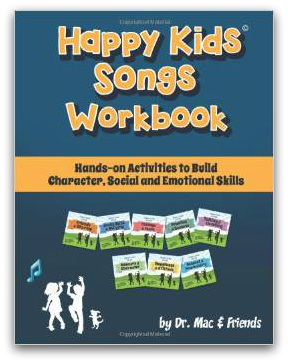 We also received the Happy Kids Songs Workbook: Hands-On Activities to Build Character, Social, and Emotional Skills. Happy Kids Songs aren’t just entertaining. These songs help children learn how to deal with important life issues. The first album we listened to was the Friends and Sharing album. 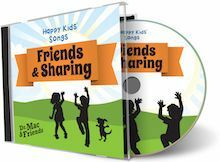 These songs help kids learn about friendship, how to share, and even how to say goodbye. Our favorite song from this album is Sailing on the Seven C’s. We learned all about the ingredients for friendship: Caring, Consideration, Commitment, Communication, Concern, Curiosity, and Cooperation. We then listened to Happiness & Attitude. This is definitely an area where my kids could improve. These songs work to reinforce positive thinking and thankfulness. We enjoyed Shake It Out and Dance, which helps kids go from I can’t to I can! Manners & Character is an area where we can all improve, right? Our favorite song from this album was The Magic Word. We’ve all heard that the magic word is “please,” well this song turns that saying into a catchy tune that is hard to get out of your head! The other songs on this album address lying and respecting others. We also received the Happy Kids Songs Workbook. This workbook includes 125 pages that feature lyrics to all 40 songs, as well as activities to go along with each song. The great thing about this workbook is that the pages are reproducible, so you can use one workbook with all of your children. I used the albums very informally with my children. I would play the songs while the kids were playing quietly and I would be sure to point out what we were learning with each song. The kids did enjoy getting up and moving to the music. I think their favorite songs are definitely sticking with them as I hear them humming a familiar tune every now and then. The songs are great. They are very catchy and I love the message that they send to help build character and reinforce positive values. I love that the workbook is reproducible. My only complaint with the workbook was the wide age range that it is appropriate for. All of my kids are still very young, so many of the pages were way beyond their comprehension. They could easily complete a coloring page or matching page, but some pages asked specific questions and then provided space to write answers and that seemed to definitely be targeted toward older children. Overall, we were happy with the product and had fun using it! Each album is available for purchase as a download for $4.95. The workbook is available for $12.56.